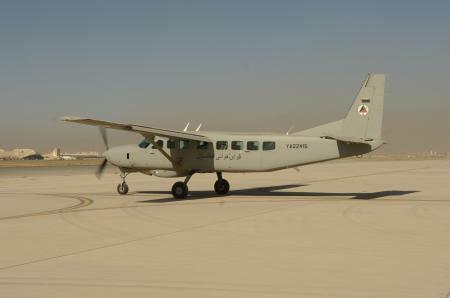 A multi-use aircraft used by the Afghan Air Force (AAF) is the C-208. It is used for personnel and cargo transport. In addition, it is sometimes used to move injured or wounded soldiers or police. C-208B Grand Caravan. The AAF has 24 C-208B Grand Caravan that it uses for training, liaison, transport, and casualty evacuation. AC-208 Eliminator. The AAF will be receiving a number (?) of AC-208 aircraft for armed intelligence, surveillance, and reconnaissance missions. The aircraft are being provided through the Foreign Military Sales (FMS) program; although, in this case the aircraft are being funded by the U.S. This aircraft was first developed for the Iraqi armed forces. The aircraft carries two Lockheed Martin AGM-114 Hellfire air-to-surface missiles and/or two rocket pods on dual-launchers under each wing. Resolute Support, From the Ground Up: Rebuilding the Afghan Air Force, January 14, 2018. This short video shows the crew of an Afghan Air Force C-208 conducting a parachute resupply mission. (2 mins). DVIDS, Afghan C-208 pilots execute new capability, April 7, 2017. Advisors from TAAC-Air have worked with their Afghan counterparts to provide an airdrop capability with the C-208 aircraft.